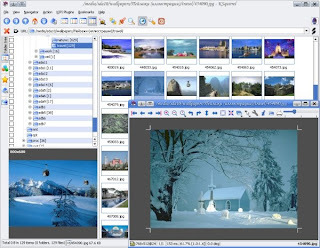 An image viewer (also known as image browser) is a desktop application that can quickly display or handle stored graphical images in different graphics file formats. It can render images according to properties of the display such as display resolution, color depth, and color profile. Other image viewers have advanced features like editing and web publishing. Some Linux users may not care much on whatever image viewer they are using. But to those who are rather picky, they can always get and install other image viewers with different features to suit their needs. imgSeek is a photo collection manager and viewer with content-based search and many other features. The query is expressed either as a rough sketch painted by the user or as another image. * Transform images or batches automatically: Place text captions, change brightness, contrast, blur, etc. Apply lossless rotations automatically if jpegtran is available. * Supported file formats are jpg, gif, bmp, png, xbm, and pnm. 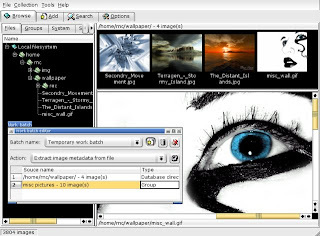 If you have ImageMagick installed, imgSeek will also support over 87 image formats. 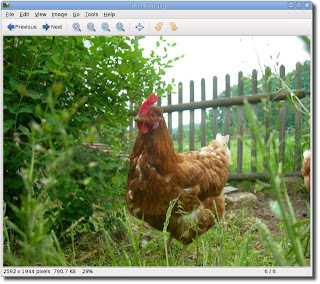 Gwenview is an image viewer for the KDE desktop environment. 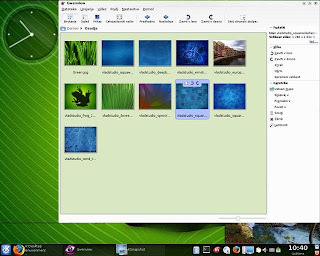 While it was available in KDE 3, the KDE 4 version has a simplified user interface, making it more suitable for quickly browsing through collection of images. It provides full-screen interface that can be used to display images as a slide-show. Eye of GNOME is the official image viewer for the GNOME desktop environment. Unlike some other image viewers with advanced features, Eye of GNOME will only view images. It does, however, provide basic effects for improved viewing, such as zooming, full-screen, rotation, and transparent image background control. KSquirrel is another image viewer for the KDE desktop environment with a disk navigator, file tree, thumbnails, extended thumbnails, dynamic format support, DCOP interface, KEXIF and KIPI plugins support. It supports more than 50 image formats, including PNG, JPEG, PSD, APNG, GIF, WMF, OpenEXR and many other. 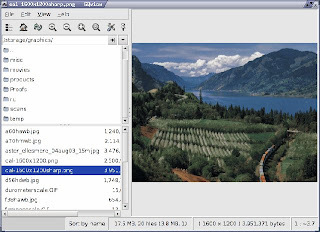 gThumb is a feature-rich image viewer and organizer for the GNOME desktop environment. It was originally based on GQView, and is designed to have a clean, simple interface. gThumb allows the filesystem to be browsed for images. They can be organized into catalogs, or viewed as a slideshow. Folders and catalogs can be bookmarked, and comments may be added to images. Many basic image-editing features are included, such as: rotation, resizing, cropping, and image enhancing filters such as color, brightness and contrast adjustment. gThumb can also export Web-based albums with various theme templates. GQview uses the GTK+ toolkit, designed to run on the X Window System. Its key features include single click file viewing, external editor support, thumbnail preview, and zoom features. Some image management features are also included. 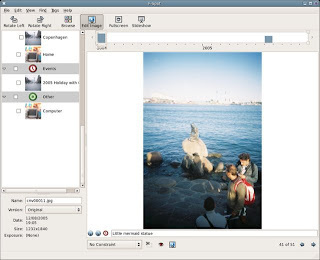 F-Spot is lightweight image viewer and organizer for the GNOME desktop. It aims to have an interface that is simple to use, yet still supports advanced features such as tagging images and displaying and exporting Exif and XMP metadata. All major photographic image formats are supported, including JPEG, PNG, TIFF, DNG and several vendor-specific RAW formats (CR2, PEF, ORF, SRF, CRW, MRW and RAF). Basic functions such as crop, rotate and resize are available alongside more advanced features such as red-eye removal and versioning. What? "best", "image viewer", but not feh ? Dude, fspot requires MONO, and it's heavy as hell. It's lousy, just because it uses mono. My favorite - KView is not on the list. But I have to admit, I miss IrfanView from my windows days. in my opinion, Picasa rocks the socks of all these other programs! It's not open source but it's the best viewer for linux by a long way. Don't mistake the term "simplified user interface" for Gwenview. The interface is adapted to modern standards - but it offers as many (and even more) features as its KDE3 counterpart. Rather strange that you included F-Spot, but missed DigiKam a application considered best of breed by many. And if you only want to focus on the viewers, you should give ShowFoto a closer look. 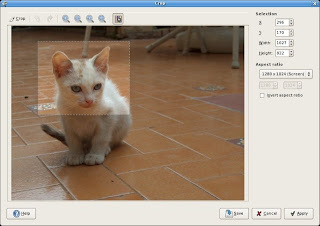 It's a stand-alone image viewer/editor from DigiKam. what about Ristretto from xfce?!? I think IT is lightweight!! Ristretto, Dude. It rocks. Actually, it's an essential very lightweight image viewer for the xfce desktop environment. My "image viewer" is Nautilus set to thumbnails with all the image formats set to open with GQview when I click on them. GQView is set to hide everything except the image it's displaying. 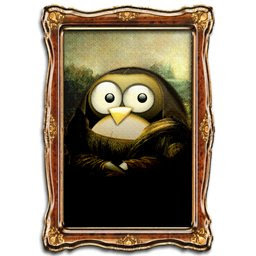 Because GQView is so fast in loading, this combination with Nautilus works like a pop up image viewer in a file manager. Irfanview is FANTASTIC and FREE and has been around for ages. Easy and intuitive, does lots of what you want for using images. Runs WELL under WINE. Don't forget digiKam. Almost as good as IrfanView, and covers other functions, too. Surprised not to se Digikam here... It's brilliant, with tagging, ratings, showing raw-images and so on. If making a distinction between "image viewer" and "photo manager," F-spot I believe falls into the latter because it requires importing into a database structure. I haven't used all the apps listed (and all but a few have I used recently), but gwenview i don't think requires any "directory import" but pulls directly from the active directory. Reason I haven't used other apps?? Because digikam is all I need. Digikam rocks for all the photos I want to tag and retain for life. For random other images, "Eye of Gnome" (default on Ubuntu) or Gwenview both work fine (I love Gwenview's new UI). xli is the way to go! Even though I am a KDE user GQvuew was my favourite for a long time until the KDE 4 version of Gwenview came (I didn't like the KDE 3 version). I still like GQview for it's simplicity and ease of use. For me it's still one of the very best. Holy crap, where alot of other decent soft of this type? picasa, xnview, kview, mirage, digicam and alot of other? I still use the old school xv which is still included with Slackware. It hasn't been updated in years but still does the job for me. I just "discovered" Geeqie -- it is great, simple, quick viewer. That is all I needed.